Bearish investors and traders are afraid that rising inflation will kill the bull market in stocks. I disagree. Inflation is not high right now. History shows that rising inflation is not consistently bearish for the stock market. 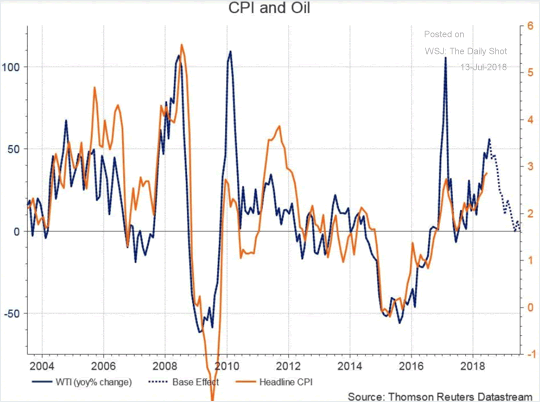 Stagflation is bearish, not inflation. Rising inflation is normal when the economy is growing. There are no significant signs of economic deterioration (stagflation) right now. Here’s an overview of inflation. Here are periods of prolonged rising inflation. This is what happens to the stock market when inflation goes up. The S&P 500 went higher while inflation went up, even though there was a “big correction” along the way. The S&P went higher when inflation went up, even though there were 2 big corrections along the way. The S&P went up at first when inflation went up. But then the S&P started to go down when inflation turned into stagflation. The stock market and inflation went higher at the same time. This is normal for the first leg of a bull market. The stock market went higher, although there was a “big correction” and multiple “small corrections” along the way. The stock market generally went higher, although there were 2 big corrections along the way. The S&P was generally flat during this period of rising inflation. There was a big correction along the way. The stock market went down (bear market) during this period of rising inflation. The stock market generally trended higher, with multiple “big corrections” in between. The stock market generally went up, with multiple “small corrections” along the way. The stock market generally went up, even though there was a “big correction” along the way. The stock market generally trends higher as inflation rises. However, rising inflation does cause the stock market’s volatility to increase (i.e. multiple corrections along the way). Inflation causes corporate costs to rise. But it also causes corporate revenues to rise, which means that inflation doesn’t have a significant impact on real (inflation adjusted) corporate earnings. *We are looking at the nominal value of stock prices. Ultimately it’s stagflation that kills bull markets in stocks. There are no signs of significant economic deterioration right now, but we are on the lookout.